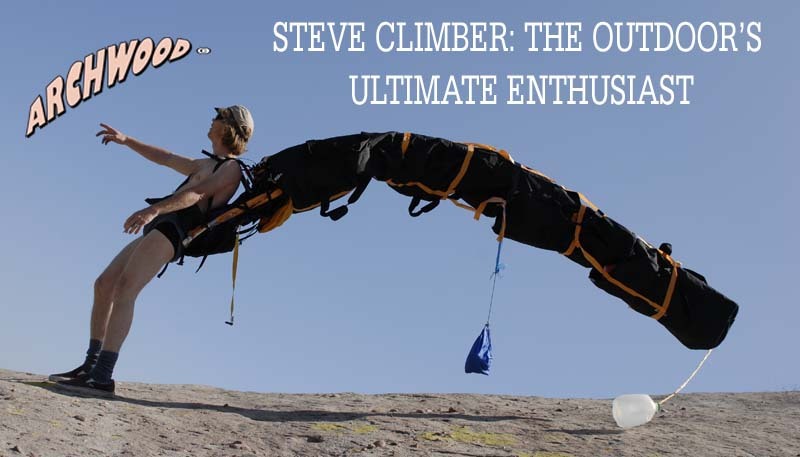 Ever wonder what Steve Climber is wearing? Now available to the public for the first time, the French Wedge. Made of a revolutionary fabric, it never needs washing! Your hair, fluids and substances actually make it stronger, binding them all together to make this the most durable and cutting edge piece of outdoor equipment ever invented. Thanks to the good people at Archwood, you too can look like Steve Climber out on the trail. In this early footage of Steve Climber you can follow him as he checks on things and has a bit of a problem with Uncle Jessup. Steve is modelling the Flextrek 37 Trillion backpack and showing off his flashy new hiking look (featuring the “french wedge” shorts) in this fine Archwood production. You wouldn’t think so, but this pack actually makes climbing easier!! See for yourself in this promo video. See how it performs in high winds, wow! No wonder Steve Climber won’t hike, climb or do anything without his Flextrek 37 Trillion Gravitrex.